What Is Lymphatic Massage Or Lymphatic Drainage? If you are not familiar with the lymphatic system of our body, than it is no suprise that you have never heard of a lymph massage either. In fact… many people that I speak of have never heard of it before either. Your lymphatic system contains a series of lymph nodes whose primary role is to help fluid and waste leave the body. It plays a crucial role in regulating your immune system. As you can imagine then when the lymphatic system becomes blocked, fluid builds up causing your entire system to become toxic, making us feel sluggish and more susceptible to viruses & contagious diseases. What Is Involved During A Lymphatic Drainage Session? Transports nutrients to cells and increases their metabolism. In contrast to other forms of massage, lymphatic drainage uses a very light pressure combined with soft pumping movements in the direction of the lymph nodes. (See diagram of equipment above). The lymphatic drainage process can take anywhere from 30 minutes with the therapist concentrating on a specific localised area like the sinuses, to up to two hours when working on the whole body. Your Lymphatic Massage Therapist will take the time to consult with you first about your particular Issues of concern. We will then determine the number and frequency of future sessions to achieve those goals. 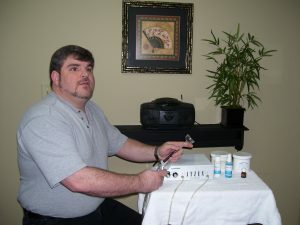 Many clients report feeling a difference after only one treatment. Who Can Benefit Most From Lymphatic Drainage? We find that lymph drainage massage is especially useful for those suffer regularly from colds, flu symptoms and sinus problems. It is also recommended to reduce puffiness or swelling. It has been reported to also have a positive effect on problem skin, cellulite, dysfunctional respiratory systems and people with low energy. What Are The Benefits Of Lymphatic Massage And Lymph Drainage? Reducing puffiness caused by water retention, poor circulation or pregnancy. Promotes the body’s own natural healing mechanisms. Would you like to see what one of my clients have said about how lymph draiange has helped her sinus headaches? If you think you would like to talk to a lymphatic drainage therapist like myself, please feel free to pick up the phone and ask any question you may have. I would love to be of service to you.